Marjorie “Slim” Woodruff is a contributor to Writers on the Range, the opinion service of High Country News. She works at the bottom of the Grand Canyon. 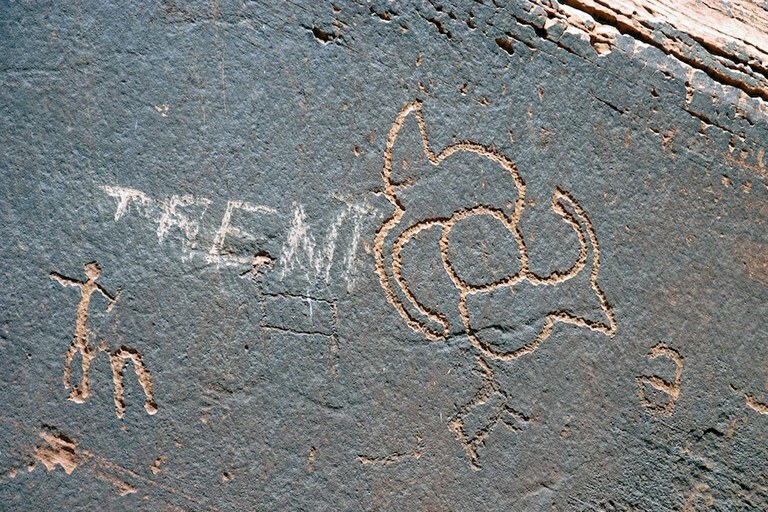 Graffiti in Glen Canyon National Recreation Area. Drones are noisy as well as intrusive. We were sitting on the edge of an isolated cliff watching the birds fly by when a racket resembling a chainsaw intruded. A drone hovered overhead. The birds egressed. Fearless Leader clambered up the hill to inform the miscreants than drones are prohibited in national parks. The man said, “Oh, I didn’t know that.” The young son piped up, “Yeah, you did, Dad. We saw that sign back there!” The kid obviously missed the memo to not snitch on dad. It is a matter of differences in philosophy. Those of us who listen to the susurration of the wind or the gentle grawks of the ravens will never understand anyone who needs tunes badly enough to drag them along. Those for whom silence is oppressive do not understand why some of us value that selfsame silence. Graffiti is destroying our national landmarks. I’m on a mission to stop it.